Answer 1 (a) A device that is used to break an electric circuit is called switch. Question 3. Explain why the bulb would not glow in the arrangement shown in Fig. 12.13. Answer 3 The handle of tester is made up of plastic which is an insulator, which does allow to current to flow. That is why the bulb is not glowing. Question 4. Complete the drawing shown in Fig 12.14 to indicate where the free ends of the two wires should be joined to make the bulb glow. Question 5. What is the purpose of using an electric switch? Name some electrical gadgets that have switches built into them. Answer 5 Electric switches are used to supply or cut electricity to the electric appliance by opening or closing the circuit. Some of the electrical gadgets that have switches build into them are torch, mixer grinder, electric toys etc. Question 6. Would the bulb glow after completing the circuit shown in Fig. 12.14 if instead of safety pin we use an eraser? Answer 6 Since eraser is an insulator so it does not allow the current to pass.Hence the bulb will not glow. Question 7. Would the bulb glow in the circuit shown in Fig. 12.15? Answer 7 The bulb will not glow because the two terminals of the cell are connected to the single terminal of the bulb. Question 8. Using the “conduction tester” on an object it was found that the bulb begins to glow. 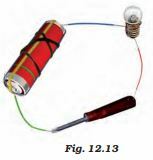 Is that object a conductor or an insulator? Explain. Answer 8 Since the object allows current to flow and completes the circuit and makes bulb to glow. It means the object is a conductor of electricity. Answer 9 Rubber is an insulator. Electricians frequently touch wires carrying current. Since human body is a good conductor, electricians may get shock. To prevent themselves from electric shock or flow of current, the electricians use rubber gloves while repairing. Question 10. The handles of the tools like screwdrivers and pliers used by electricians for repair work usually have plastic or rubber covers on them. Can you explain why? Answer 10 Rubber or plastic are bad conductors of electricity and do not allow current to flow through them.Without the help of insulators, the use of electrical tools like pliers and screwdrivers will give electric shock to user.When electricians touch these live electric wires with these tools covered with plastic or rubber, current does not flow in their body making safer them from any accident.